Running in Quebec City, Quebec. 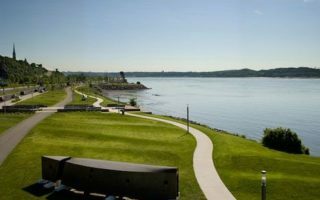 Best routes and places to run in Quebec City. 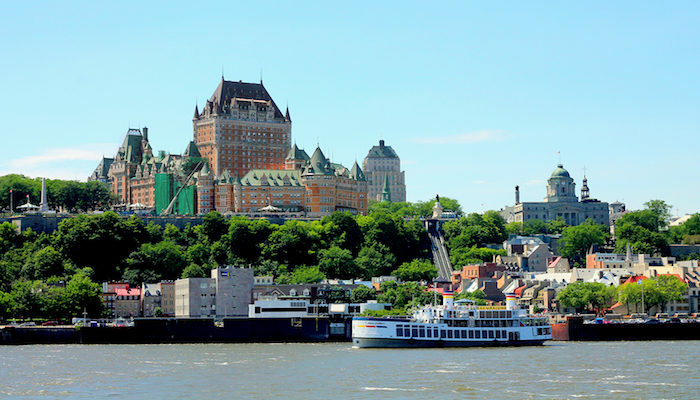 Located in the St. Lawrence River, Quebec City is one of the most beautiful cities in North America. It is the capital of the province of Quebec and is primarily french-speaking. It’s also one of the oldest cities in North America, dating back to 1608. The setting is unique, with ramparts being the only fortified city walls remaining north of Mexico, and a UNESCO World Heritage site. Old Quebec sits on a promontory (there’s an ‘Upper’ and ‘Lower’ city). 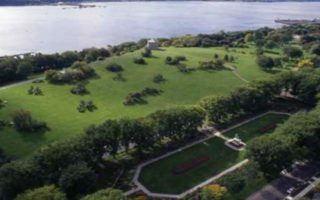 Important landmarks include the Battelfields (Plains of Abraham), the Quebec Parliament, the Museum of Civilization, and the National Museum of Fine Arts. This is our guide to the best places to run in Quebec City, Quebec. Running in Quebec City is a treat. Most of the best runs are centrally located, near visitor hotels. 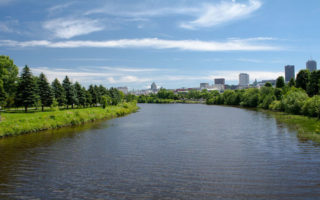 Highlights include a run along the Plains of Abraham, a ‘runseeing’ tour of Old Quebec, wonderful running paths along the St. Charles River and the St. Lawrence River, and a couple of great parks, such as the Promenade de Champlain and the Bois de Coulogne. Quebec is very visitor and tourist-friendly, and trails are well signed. Weather is a major factor in Quebec City running. While summers are warm, winters are among the coldest and snowiest of any major city in the world. There is typically snow on ground from November to April. So, bring your Yak-Traks! That said, Quebec embraces its winters, and people are out there on gorgeous winter days. The city also does a great job of snow clearing. A 5 mile 'runseeing tour' of Quebec City. 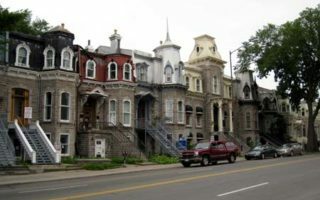 Includes Rue des Remparts, Promenade des Gouverneurs, outskirts of the Citadelle, Parliament grounds, Fortifications of Québec, a jaunt around the basin, and plenty of hills and stairs! 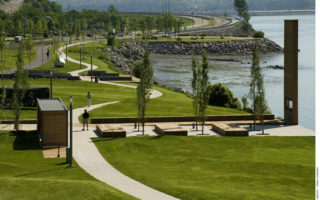 A wonderful bike and pedestrian path, with great water views along most of the way, and several Quebec sites and parks. Many loop options possible, incorporating the multiple bridges and paths on both sides of the river. A bicycle/pedestrian path along the St. Lawrence River, paralleling Boulevard Champlain, for nearly 10km. Good water views most of the way. A highlight is the 2.6 km Promenade Samuel-De Champlain, starting at the 7k mark. Wonderful park and bike path, inaugurated in 2008 as a gift from the government of Québec to the capital for its 400th anniversary. Has won numerous awards. Several sections, for 4km to the Laporte Bridge. 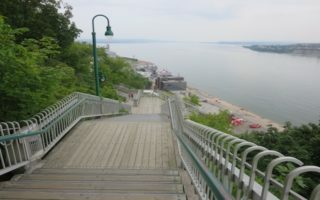 There are 30 sets of stairs linking Quebec's Upper and Lower towns. There are 10+ sets that have more than 100 stairs, with Cap-Blanc featuring 398 stairs. Do them as a run or incorporate with another route. Pleasant run in Quebec City's attractive residential area. The area north of Grande Allée and south of Ch. St-Foy, inside Ave. Belvedere to the west. Attractive homes, wide sidewalks. 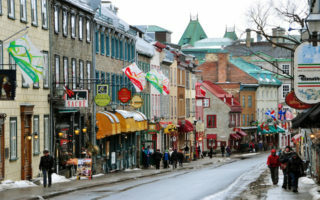 Quebec City has a humid continental climate. Summers are warm and occasionally hot, with average high temps in the 70sF (25C), with cool-ish nights. Autumn is relatively short and crisp, with beautiful colors. The defining weather element of Quebec City is winter, which is very cold and snowy. Average January temps hover near 0F (-17C) at night, and high temps are about 18F (-7C). 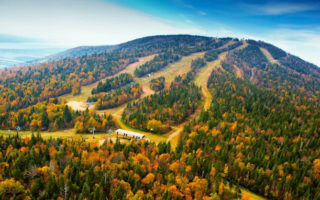 The city averages 125 inches of snow annually, and there is typically snow on the ground from mid-November to mid-April. Adjust your footwear and clothing accordingly! The northern location also means daylight difference of nearly 7 hours between winter and summer. Quebec City has two major independent running stores, centrally located and near each other. Le Coureur Nordic. Great store and very helpful people! Group runs throughout the year. Monday at 17h30 and Tuesday at 18h15 from their store. Wednesdays, there’s XC skiing in winter! In summer they do Thursday trail runs. This link has more info. Coin des Coureurs (Running Room). Quebec City outlet of popular Canadian running store chain. Group Runs: Wednesday evenings and Sunday morning 8:30 a.m.
GoGuide has wonderful running tours of Quebec City.